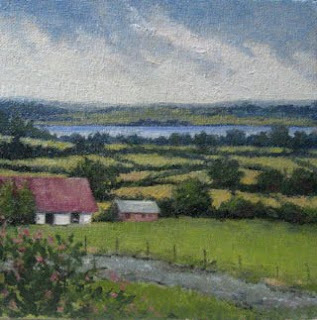 Just had to do another painting of Ireland from Bill Guffey's current Virtual Paintout challenge. I loved that this view had the hedges dividing up the fields, as well as the hedge rose. Also liked that I found an area that had some sunshine and a lake! This is a painting done for Bill Guffey's Virtual Paintout Challenge, using Google maps. The view is from the Castle Road in Newton Abbey, North Ireland, and is my first submission to Bill's online challenge. I have to say that there were so many beautiful landscape views that it made it difficult to settle on just one! This is a very old railroad bridge that spans the Susquehanna River in Harrisburg, PA. It is just upriver from my previous post 'Early Fall Along the Susquehanna'. I was lucky enough to see a train crossing the bridge while I was taking reference photographs for this painting. I actually took the photos while we were crossing the river over the George Wade Bridge, and was amazed that the pictures came out so well! Back in the 90's, I was fortunate to see an exhibit of Rene Magritte's work at the MOMA in NYC. It was exceptional. 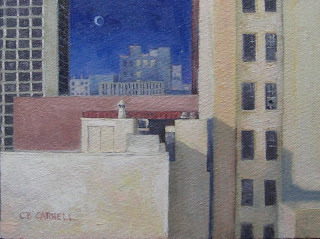 When I saw Karin Jurick's photograph for the DSFDF City Rooftops Challenge and the distant view of the city, I immediately thought of some of my favorite Magritte paintings in which he portrays both day and night in the same painting. Hope you like this, and if you look around the painting a bit you might see a very tiny image that Magritte was famous for...kind of like "Where's Waldo", but according to Magritte! 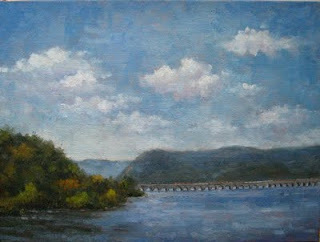 Yesterday I painted this picture of the Susquehanna River and the George Wade Bridge. The leaves were just beginning to change, so it was nice to have spots of bright color in the large areas of green. The receding blues were really attractive, and I enjoyed playing with the colors and values to get the depth in this one. 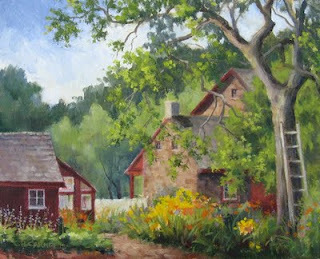 This Summer, the group that I paint with outdoors went to this Day Lily Farm in New Cumberland, Pennsylvania. I never saw so many different colors and varieties of day lilies. The home and the barn were made of this rich, brown stone - it was difficult to settle down and find just one location to paint. I decided on this view of the house, greenhouse and outbuilding because of the flowers growing amongst them, and also because I really liked the ladder leaning up against the tree. 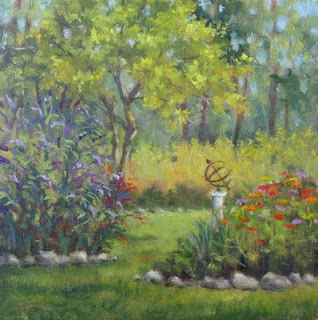 This is the painting I did while attending the Kings Gap State Park Garden Harvest Day. Because of the rain and nice weather we had this past Summer, the flowers were still gorgeous even though it was early October. Had such a good time that day! Today, four of the artists from our plein aire group and I painted on site in the gardens of the Kings Gap State Park here in Pennsylvania during the Garden Harvest Day festival. It was a gorgeous day, and because of the mild Summer we have had, the flowers in the garden were still quite beautiful. Lots and LOTS of people attended the festival, so there were lots of interesting comments and questions for the artists. I have to say that I especially enjoyed the little ones and their candid remarks! 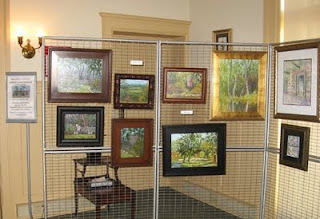 In addition to painting, we also had an exhibit of other plein air paintings we have done of the park. It was held inside the mansion during the festival, and was very well-attended. Thanks to everyone for helping this come together. Pat Putz, I appreciate all the effort you put into getting this whole idea off and running - thank you so much for everything you did. Thanks to my daughter Amanda, who helped me set things up in the mansion on Saturday. Mary Beth, the name tags were a great idea! 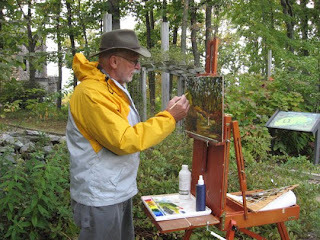 And special thanks to my husband for staying in the mansion to manage the exhibit, allowing us all to paint outside! Here's a picture of me starting to block in my painting. Ralph Hocker just started, and he's almost done already! He was working on a support that he had initially painted an intense red, and it really made all of the greens he was using in his painting sparkle. 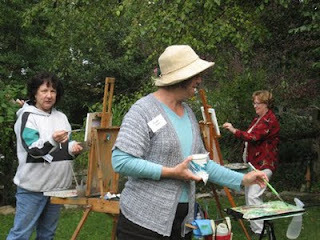 Pat Koscienski, Sue Gray, and MaryBeth Brath found a perfect area that allowed them the choice of painting the lily pond, or the old Kings Gap Water Tower. 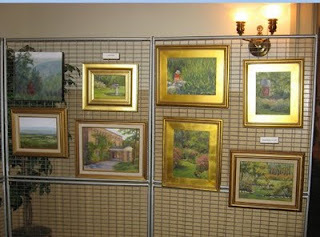 Lyn O'Neal's paintings and my paintings(the four on the right) on exhibit at the mansion. Paintings done by MaryBeth, Ralph and Sue. MaryBeth's are the four paintings on the left. (When I saw her painting of the older gentleman on the bench, I was quite impressed because that same gentleman walked into the mansion this morning as I was setting up the exhibit, and although I had never seen him before I recognized him immediately in her painting!) 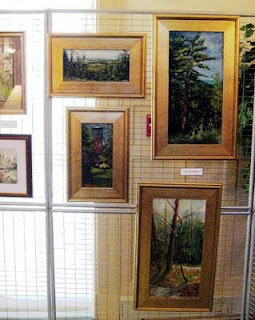 Ralph's paintings are the four in the middle (we think he got at LEAST three offers on his painting of the Kings Gap Water tower), and two of Sue's beautiful watercolors are on the right. Pat's gorgeous acrylic and oil paintings are on the right, and Sue's other two watercolors are slightly visible on the left. Haven't posted in awhile. There's been so much going on - most of it just life in general! 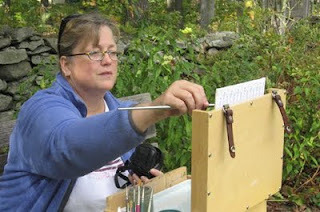 I am getting ready for a plein aire event at the Kings Gap Nature Conservancy tomorrow. 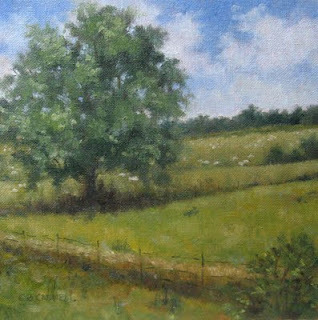 I will be painting on site in the gardens with some fellow artists, and we will also have paintings we've done of Kings Gap on display in the mansion during their Garden Harvest Day festival from 1:00 to 5:00 P.M. 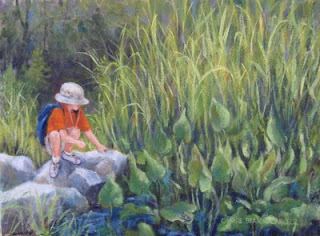 I was working on my 'Down the Garden Path' painting when I noticed one of the other artist's son looking for frogs in the pond. Took some photos, and then worked on this one at home. If you look closely, you will actually see a tiny frog on one of the lily pads!